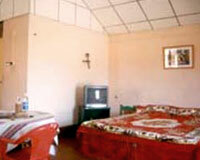 Hotel Veerabhoomi Tourist Village is located near to the bus terminus, in a typical village atmosphere. 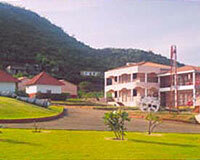 Veerabhoomi Tourist Village is a holiday resort situated at a foothill amidst rolling landscape and sylvan surroundings. Veerabhoomi has different types of cottages. 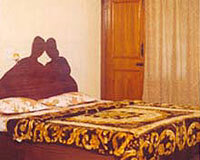 The cottages, of ethnic Indian design are a perfect blend of tradition and modernity. To remember the past glory, cottages are named after great dynasties & emperors of Karnataka like Mysore, Chalukya, Kadamba etc. 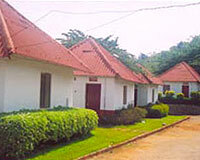 The cottages are beautifully designed and are categorized into Standard Cottages and Deluxe Cottages. 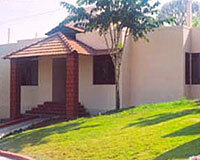 Each cottage provides 24 hours generator backup and many other facilities to suit the requirements of guests. Veerabhoomi Tourist Village has one multi-cuisine restaurant.